Photographing a black hole sounds impossible, a contradiction in terms. But Shep Doeleman and a global coalition of scientists are on the cusp of doing just that. With exclusive access to the team, journalist Seth Fletcher spent five years following Shep and an extraordinary cast of characters as they assembled the Event Horizon Telescope, a virtual radio observatory the size of the Earth. He witnessed their struggles, setbacks, and breakthroughs, and along the way, he explored the latest thinking on the most profound questions about black holes. Do they represent a limit to our ability to understand reality? Or will they reveal the clues that lead to the long-sought Theory of Everything? 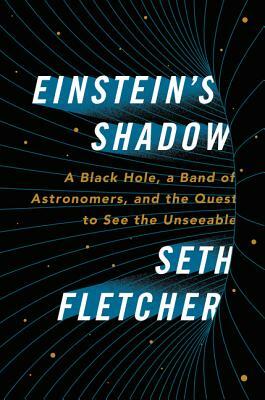 Fletcher transforms astrophysics into something exciting, accessible, and immediate, taking us on an incredible adventure to better understand the complexity of our galaxy, the boundaries of human perception and knowledge, and how the messy human endeavor of science really works. Weaving a compelling narrative account of human ingenuity with excursions into cutting-edge science, Einstein’s Shadow is a tale of great minds on a mission to change the way we understand our universe—and our place in it. Seth Fletcher is chief features editor at Scientific American and author of Bottled Lightning: Superbatteries, Electric Cars, and the New Lithium Economy. He lives in New York’s lower Hudson Valley with his wife and daughter.